New York doesn’t go to the lengths Copenhagen does to accommodate cyclists during road work, but I’ve noticed a tiny move in that direction lately. This is the Grand Street bike lane, where construction on a building on the south side of the street has made the sidewalk impassable. 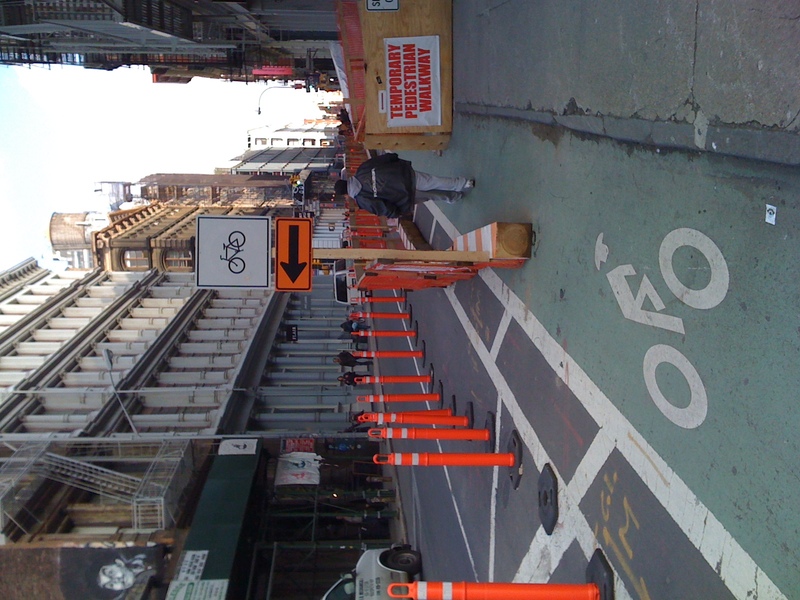 The DOT installed a temporary pedestrian walkway, moved the bike lane over a few feet, and put in orange poles to demarcate the path. It’s just one block, but it sends a signal that cyclists matter. Even the sign tells me there’s a different institutional mindset at DOT these days. As someone who uses this lane almost every day to get home, this makes a big difference in my ride. Plus, did you notice? Parking on this side of the street is gone for now. Not a peep from the media!